Taking a kitchen sink approach to milk shakes, Baskin-Robbins debuts new Freak Shakes at participating shops nationwide through the end of July. The new, limited-time shakes basically take the chain's recently-introduced Sundae Shakes and tops them off with more than a few toppings. 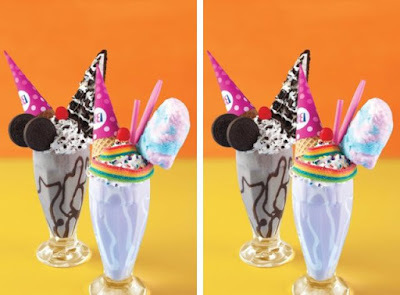 - Unicorn Freak Shake - A Cotton Candy milkshake with a scoop of Cotton Candy ice cream topped with Charms Fluffy Stuff Cotton Candy, Airheads Xtreme Rainbow Berry Sweetly Sour Candy strips, a sugar cone, whipped topping, a cherry, rainbow sprinkles, and marshmallow garnish. - Oreo 'n Cookies Freak Shake (only available at standalone shops) - An Oreo Cookies 'n Cream milkshake topped with a scoop of OREO Cookies 'n Cream ice cream, a hot fudge drizzle, whipped topping, a slice of Oreo Cookies 'n Cream Polar Pizza, a sugar cone, a cherry, and Oreo cookie pieces. - Donut Shop Freak Shake (only available at Dunkin' Donuts/Baskin-Robbins combination shops) - A Jamoca Almond Fudge milkshake with a scoop of Jamoca Almond Fudge ice cream topped with hot fudge, whipped topping, Dunkin' Donuts Powdered and Chocolate Munchkins donut holes, a Dunkin' Donuts Chocolate Frosted with Sprinkles Donut, a sugar cone, a cherry, and rainbow sprinkles.